MARUAH is celebrating Nelson Mandela. 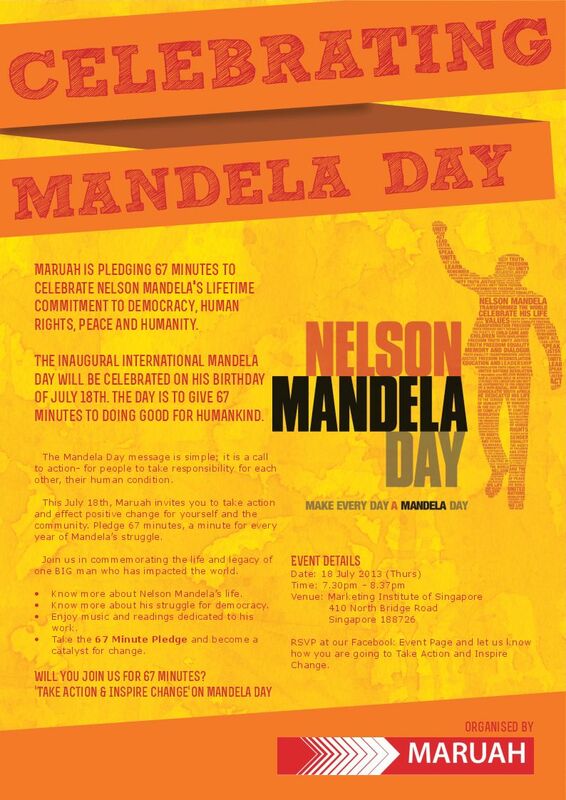 We are organising International Mandela Day to reiterate our commitment to the values that he has upheld. Democracy, human rights, peace and being of service to the community – important values. Please do come and celebrate with us. We hope many will also opt to express their thoughts and make this their event – to celebrate the life of a person who inspires. Stand with us to take a pledge to uphold these values and to act on them. This entry was posted on Tuesday, July 9th, 2013 at 8:45 am and is filed under Events. You can follow any responses to this entry through the RSS 2.0 feed. You can leave a response, or trackback from your own site.